On June 9th, 2006, three detainees died inside the Guantanamo detention camp. The prison authorities said that the detainees had taken their own lives. The parents of the prisoners said that their sons were killed. 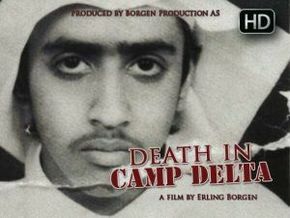 Death in Camp Delta is the story of one of the deceased, Yasser Al-Zahrani from Saudi Arabia. He was only 17 years old when he came to Guantanamo in 2002. His father has filed a case against Donald Rumsfeld, stating that his son was tortured, then killed and returned to him in a box, in pieces. The Norwegian filmmaker, Erling Borgen, a professor of investigative documentary filmmaking who has produced 44 documentaries, has been to seven countries and worked for three years preparing DEATH IN CAMP DELTA. He interviews released Guantanamo prisoners, lawyers representing the prisoners and describes a father’s struggle to find out the truth about what happened to his son.